Full-size keyboards have one problem: they’re big. We’ve seen roll-up pianos, but limp pieces of vinyl with membrane action aren’t much fun to play. Ever looked at your keyboard and just wished you could fold it up? Inventor David Bubar thinks he’s got the answer. 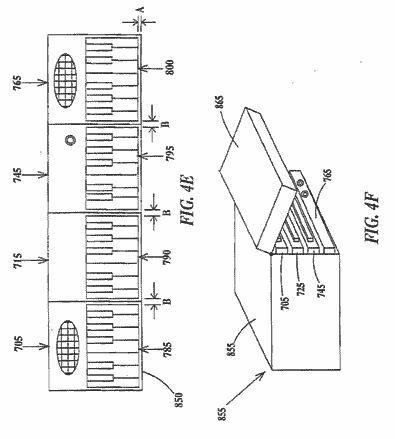 He’s patented a design for a fold-up keyboard, and has published the patent in hopes of generating interest. All the electronics for the keys and even a full-fledged synth action are there, but by dividing the instrument into modules with interconnecting sockets, Bubar claims you can fold his keyboard into an area a third its size. Suddenly, your 88-key mega-synth folds down to the size of those cheap two-octave keyboards. There’s only the patent — no working prototype — but the designers will be at NAMM next week where CDM will be interviewing them. If you’re intrigued, or skeptical, or both, there’s a call for musicians at FoldupKeyboard.com, with forums and even an open call to join their development group. Could this work? And will we ever see an actual product? Stay tuned. As for the various surveys asking if we like the idea, well, heck, yeah. Personally, I’d carry a keyboard with me everywhere if I could fold it into a backpack.